Small intimate locations with big flavors could end up being the culinary highlight of your Key West vacation. Some of the best Key West restaurants are cozy, charming and hidden away from the hustle and bustle of the world famous Duval Street. Savor the flavor and seek out three local favorites: Little Pearl, Michaels Restaurant, and the flaming buoy filet co.
A Neighborhood wine bar & restaurant. Perfect for intimate dining. Enjoy fresh local catch and innovative cuisine with a tropical twist and an extensive wine selection to pair with what you order. Little Pearl is located on the corner of Olivia and Elizabeth streets in Old Town, Key West. It is another small neighborhood restaurant that is cozy and intimate and bursting with flavor. It’s fit for foodies and everyone looking for creative cuisine that is incredibly delicious. Expect to be swept away on a culinary adventure in paradise while dining here. My wife and I have eaten at restaurants all over the world. Little Pearl was one of the top experiences that we have ever had. Dan was a great server and the food was perfection! ~ Billy Williams, Google Review. One of our favorite appetizers happens to be one of the most talked about dishes – try the Bangkok Octopus – it’s a must! Michaels Restaurant in Key West is our favorite steakhouse nestled among the charming neighborhoods in historic Old Town. Discover a garden oasis where Chef Michael Wilson and his wife Melanie offer a classic menu with an island twist. There is indoor and outdoor dining in a beautiful tropical oasis setting. Yes, they are known for best Steak in town, but there’s so much more to experience and enjoy. In addition to the Steak and other entree selections, there are so many items on the menu to spotlight and to be honest we would be sharing the entire list. That’s how good this restaurant is! Our recommendation is to make a reservation and make sure to start with a signature cocktail or martini, order the Fondue and save room for the best dessert you’ll ever have ~ Warm Chocolate Volcano. 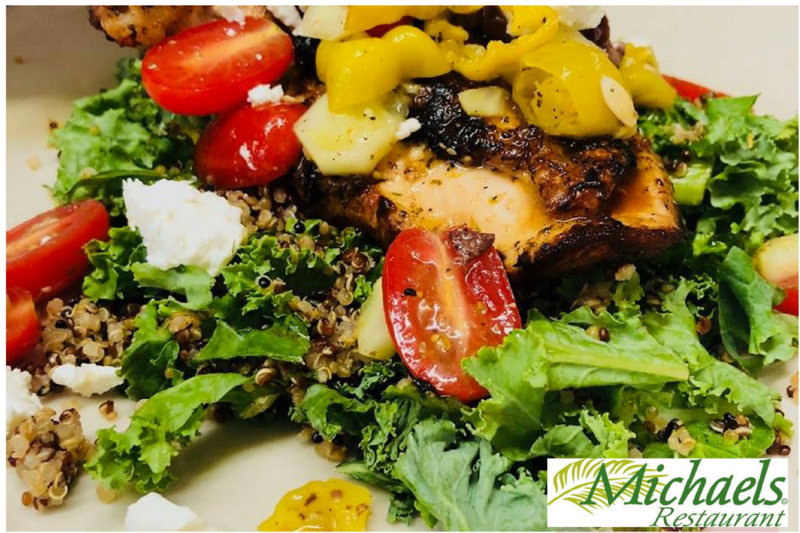 Treat yourself to a delicious dining experience at Michaels Restaurant near the corner of Southard Street- on Margaret Street; you won’t be disappointed! At the corner of Packer and Virginia Streets is where you’ll find Flaming Buoy serving up big flavors and personality in a charming, cozy atmosphere. A hidden gem with a menu that offers a mix of comfort foods we love with an island twist. Some of our favorite items on the menu are the Lobster Macaroni & Cheese, the filet co. three way, the bbq danish baby back ribs and you can’t go wrong with the fresh catch and the special of the day. To be honest, there is not one thing on the menu you don’t want to try. There is indoor and outdoor seating available but note there are ten tables available. Good to know: Make a reservation in advance. You want to make sure you get a seat at the table before someone else does. We could go on and on too. For now, take our advice and reserve a table at Flaming Buoy Filet Co. next trip to paradise.